I know and I was planning go to beach and try using the kayak at shallow water first, and try if I fell in the water, and learn how to get back into the boat. I learn all basic on kayak, then after everything going well, so start with a little deep. I did buy some safety equipment for kayak, beside my ice fishing floating suit, also life jacket. I do have the float rescue attach to paddle for help get back on to kayak. Just need the warm weather coming and start the basic training on kayak. At this time of year, just going with someone is not enough. Until you have those skills you mentioned you shouldn't go at all until warmer waters. That really good advice, Singingdong. For me as a newbie on kayak, I will not go alone, beside still need a lot to learn how to get back on the kayak if the kayak flip over, also how to make balance to make kayak stable, then how to we can stand up on the kayak, without flip the kayak. A lot of thing must be learn special for all newbie. Because is not just paddle, we also need to know how to swim, and know about our health condition if we fell in the water. Always safety is the most important, and always go with someone to company. great post and timing is perfect. I think about this every year at this time, especially when I hear hookups starting up on possibly disastrous waters. I've been yaking and canoeing for quite awhile but the water temp right now is still too cold for me to comfortably be out there. After being a sea survival instructor for helicopter pilots I have seen first hand what cold waters can do and how debilitating they can be. We forced our crews to experience the effects in a controlled environment. Most gained a quick but healthy realization that it was a whole lot worse then they ever thought. Motor skills diminish quickly. Even the best re-entry plan can become useless when you can't use your hands. Stay smart and stay safe. Without full dry gear, don't even consider going out yet as far as I'm concerned. Think of those you may leave behind instead of satisfying your itch to get out. I'll add just one thing to Thom's fine commentary - don't go alone on big water, particularly as the water gets colder. I aborted on Lake O last Saturday in conditions that were not really that bad because I didn't want to be out there alone. Good thing, too, because the wind picked up to maybe 25-30 kph in the early afternoon and even though mild whitecaps can be fun, problems are unforgiving when you're alone. I don't consider myself to have a great deal of formal kayak expertise but I do have a lot of experience. As Red Green always said, "Safety first". We said. This is a very epic adventure had. I know this is another site but it is worth leaving on so people can learn from this story also. If this violates the rules then please remove it and PM me if you want to read it. Lots of picture to help explain the near death experience. Excellent post, All excellent points. It's that time of year when the "what should I wear" threads start popping up. Read them for what they are worth. It's really pretty simple: neoprene or shell/insulation are the 2 options. Buy the best you can afford. Use the lures/reel/fishfinder you already own and spring for some decent clothing. Waaaay more important than the clothing is being honest with yourself about your paddling - and more importantly - self rescue technique. Just because you own a fishing yak, and folks are posting pics of great fish caught on big water (Lake O, Simcoe, Ottawa River) doesn't mean that you should be doing the same. If you get to a put in and think "man I hope I don't fall in the water", you should really think about putting your yak back on the car and finding something else to do. As whitewater yakkers are fond of saying "we are all between swims". If you don't know that you can self rescue on the water that you are about to paddle (conditions, temps, size), with your boat rigged the way that it is that day (rods, ffinder, crates), then you are playing hypothermia-roulette. It's not enough to have practiced on an unrigged boat in the middle of August. Cold water affects your judgement and your fine-motor skills. Rod holders, fish finders, and loose lures with sharp trebles inhibit your ability to get back in your boat. Wind, waves, and current make it harder to position yourself for re-entry. Extra clothes, gloves, and bulky PFDs make it harder to get back on/in your yak. 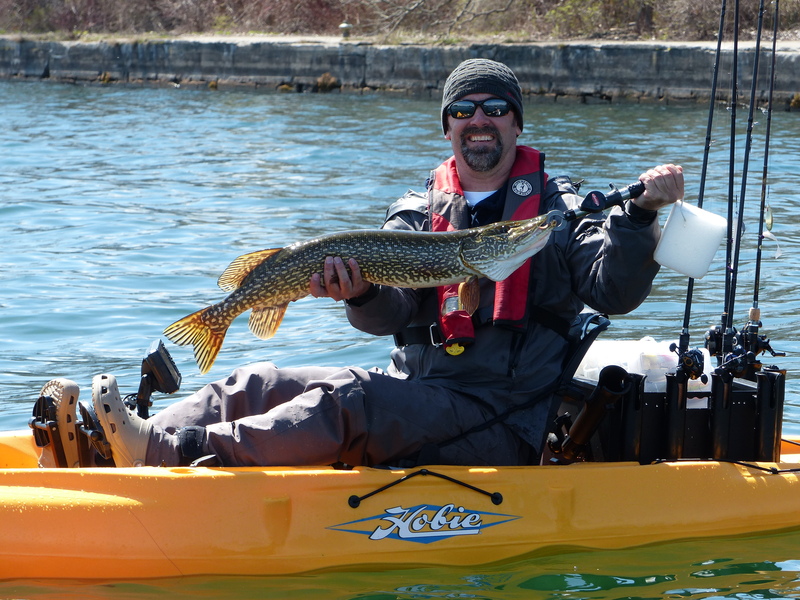 This is kayak fishing. You became a kayaker the first day that you paddled. Start acting like one. If you know more about dropshotting than you do about self-rescue, then think really hard about putting that yak on water that is cold enoug, or rough enough, or big enough to make you think twice about swimming in it. Another good whitewater saying to keep in mind this time of year: "Don't paddle it, if you can't swim it."